part of a 500 sf floor I just finished. More photos to come. this floor is made from 5/8" thick slabs of stone I had custom sawn and leather finished. all of the shapes were cut out on site using custom templates of the indoor space built outside on a flat section of ground. 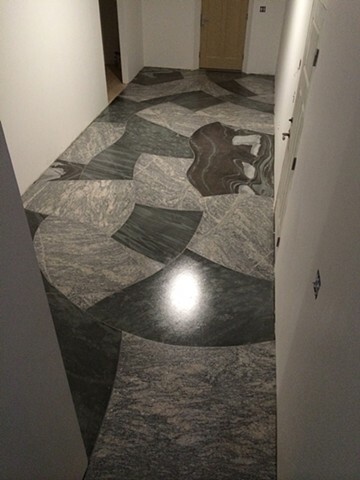 the stone covers two hallways a bathroom and a dog area and took four separate templates all matching up perfectly to each other to achieve. everything fit amazingly well.